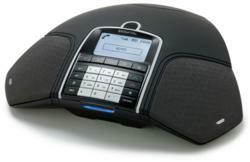 The Konftel 300W conference phone gives users the freedom of going wireless and a collection of valuable features. The Konftel 300’s ease of use, long talk time, integration capabilities, and superior sound quality make it truly exceptional conference phone. I would recommend it to any business. Lower travel costs and increased employee productivity have motivated many businesses to incorporate teleconferencing in their daily operations. Conference calls are now used by nearly every U.S. Corporation to hold client meetings, sales presentations, training classes, and employee meetings. Telcom & Data, a leader in business phone systems, is pleased to introduce the Konftel 300W wireless conference phone for a superior conferencing experience. The phone gives users the flexibility to hold meetings without the need for electrical sockets or phone jacks. The rechargeable battery provides up to 60 hours of talk time and Konftel’s patented audio technology, OmniSound® 2.0 is built into the phone to produce crystal-clear sound. The Konftel 300W was designed with many smart features to simplify teleconferences. The unit allows users to record their meetings with a SD memory card and listen to them at their convenience. The conference guide helps users set up multiparty calls and save call groups. This feature is very helpful for those that make regular calls to the same group. The Kontftel 300W is GAP compatible and can be connected to existing DECTsystems. It also connects easily to a PC with a USB port for VoIP calls. The integrated bridge system provides the capability to connect DECT, a mobile phone and USB to multiparty calls. For more information on the Konftel 300W wireless conference phone, visit Telcom & Data’s website or call 1-800-335-0229. Since 1996 Telcom & Data has been providing thousands of telecommunication solutions to organizations around the world to measurably improve communications. The company is a leader in teleconferencing and unified communications. Telcom & Data maintains a network of over 1500 technicians with locations in Chicago, Milwaukee, and Miami.